Box art of the GameCube version. 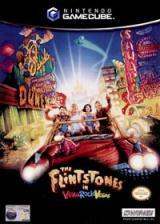 The Flintstones in Viva Rock Vegas was a European-exclusive racing game based on the film of the same name. The game was originally developed for Dreamcast, but canceled and later released on PlayStation 2 in mid-2001. A GameCube port of the game was in developed by Zombie Studios and listed and mentioned on various websites but for unknown reasons, the GameCube port was cancelled with the builds having yet to resurface. The 2000s saw a rising trend of movie tie-in video games and kart racing games. Many of these games were developed quickly and as a result, many were lackluster games that failed. The Flintstones in Viva Rock Vegas have the player race through twelve stages and participate in the Boulderball Run road race. Each race would have a player facing off against CPUs as they would race to win. The player could pick up weapons throughout the race in order to knock out an opponent. If the player won the race, they would receive diamonds. As of the writing of the article, the builds for the GameCube port have yet to surface. The only port that has been released in its entirety has been the PlayStation 2 port.